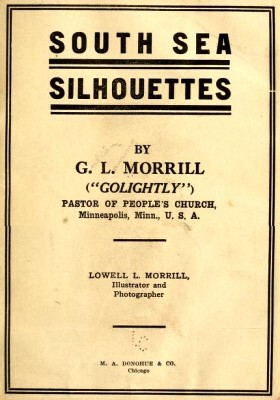 G. L. Morrill : South Sea Silhouettes, 1915. The Mid-Pacific Carnival is Honolulu's annual big show. Soldiers filled the streets in which there was to be a "Pageant, 100 Years of Peace" between England and America. The rain drowned it out but Old Glory and Union Jack were "fast" friendly colors that never ran. However, this water was good for the aquatic sports in the harbor where strong boys and shapely girls made a good exhibit of limbs that could dive, swim and float. Everybody was happy, even the German sailors who came from the Prinz Waldemar that lay interned nearby. But you should have seen the floats at night. The Japanese lantern parade was bigger, brighter and better than anything I had seen in Japan in point of artistry and artisanship. 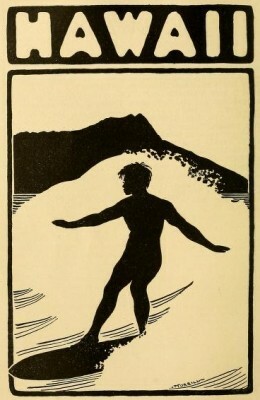 Of course I drank Honolulu's health in pineapple juice at the big factory ; looked with open-mouthed wonder at the marvellously shaped and colored fishes of the Aquarium; yelled savagely as I came in on the crest of a wave in an outrigger canoe ; splashed and floundered on a surf -board ; went on board the "Great Northern" which was the first passenger ship to come through the Panama Canal, and to the "Ad" Club where a luncheon was given to the captain and young Walter Hill who sat at my left. The Samoans are amphibious and swim as well in the sea as they can walk on land. They surf-ride in canoes and not on boards as the Hawaiians do. They are good fishers and fish with nets and shell-hooks where the water is deep and spear fish at night. It was fine atmosphere for an artist, but very bad for my neuralgia. and best in the world, with forty miles of clean sand and ideal surf-bathing. It was cold enough on land, and a little more so at the end of a pier where a few men were fishing. I bought a ticket and walked out. The only swells I saw were the waves, though in summer there are many others. The city is a picnicker's paradise. Land and sea invite you to come and go somewhere. There are lots of boat slips on the Circular Quay, where we slipped in a boat for Mosman Bay, one of Sydney's prettiest sights. Sky and water were in holiday attire, boat loads of happy passengers floated by, the harbor hills were full of beautiful residences sitting on the banks and hanging their gardens and summer houses like legs in the water. The tram took us to the Spit and took an extra Sunday fare that a fair Sunday passenger objected to. We crossed the Spit in a free punt, and then took another tram which pulled us up and down hill till we reached Manly. The Cardinal's palace and St. Patrick's college are situated here, but best of all, the beach, where religion and education are for the time being forgotten. Some of the finest beaches in the world are near Sydney, and Manly is one of the best with its hard, white sand. 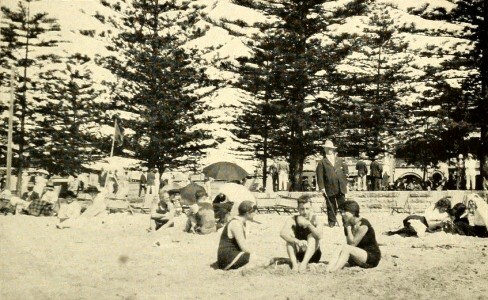 There was a fine surf where bathers were wading, swimming and sunning themselves in the sand. Here were costumes to take an artist's eye, of blooming girl bathers who wore no bloomers, and not much else to speak of. They sat and dug their pink toes in the sand and exposed arms and legs to sun, wind and wave. At Manly beach womanly forms are in great evidence. their lovers, and make love in a way that would cause the Boardwalk beauties of Atlantic City to drovm themselves with envy. To the far left rose the bare headlands, to the right a rocky promontory that hugged the sea, while in front of me the waves madly dashed into each other's arms. The bay nestled in the arms of the shore, and all around me boys and girls were taking their cues from amorous Nature and improving on her bare, hugging caresses. Geoff Cater (2013) : G. L. Morrill : South Sea Silhouettes, 1915.